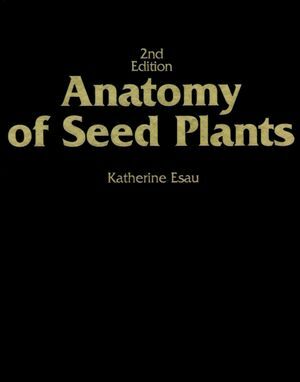 Katherine Esau was a German-American botanist who received the National Medal of Science for her work on plant anatomy. Internal Organization of the Plant Body. Summary of Types of Cells and Tissues. DEVELOPMENT OF THE SEED PLANT. From embryo to the Adult Plant. Apical Meristems and Their Derivatives. Macromolecular Components and Their Organization in theWall. Pits, Primary Pit-Fields, and Plasmodesmata. Origin of Cell Wall During Cell Division. Development of Sclereids and Fibers. XYLEM: GENERAL STRUCTURE AND CELL TYPES. Gross Structure of Secondary Xylem. Cell Types in the Secondary Xylem. XYLEM: VARIATION IN WOOD STRUCTURE. Some Factors in Development of Secondary Xylem. Developmental Changes in the Initial Layer. Patterns and Causal Relations in Cambial Activity. Structure of Periderm and Related Tissues. Outer Aspect of Bark in Relation to Structure. THE ROOT: PRIMARY STATE OF GROWTH. THE ROOT: SECONDARY STATE OF GROWTH AND ADVENTITIOUS ROOTS. Common Types of Secondary Growth. Physiologic Aspects of Secondary Growth in Roots. THE STEM: PRIMARY STATE OF GROWTH. THE STEM: SECONDARY GROWTH AND STRUCTURAL TYPES. THE LEAF: BASIC STRUCTURE AND DEVELOPMENT. THE LEAF: VARIATIONS IN STRUCTURE. THE FLOWER: STRUCTURE AND DEVELOPMENT.